The other day, Letterbox posted an infographic about how young people grow up with social media. This infographic tells, among other things, that of all children using Facebook, nearly 42% of them are 12 years or younger, even though the sign-up age is 13. That’s about 5 million children. These children are growing up in a world where even the farthest reaches of the globe can be accessible through the computer and information is only a click away. Parents’ fear of strangers exploiting their children is reflected in the answers given. 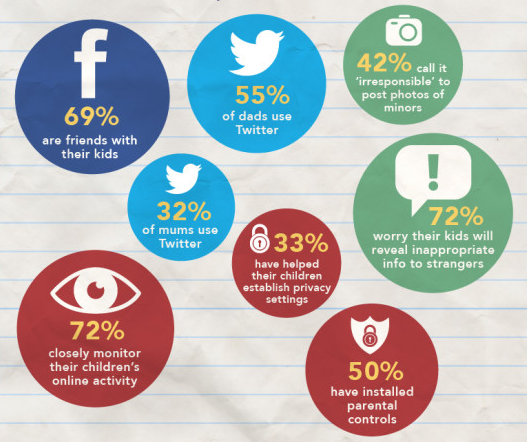 According to the infographic, 72% of the parents worry that their children are revealing inappropriate information to strangers. Without keeping a watchful eye on their childrens’ web usage, which 72% do, it can be hard to keep completely updated on which sites are visited. Only half of the parents have installed parental controls on their computers, letting them fully control what is accessed on the Internet. But wouldn’t it be nice if the children could visit a website and chat with other children, without worrying about who your children talks to and what they’re saying? So thought we. And when we made our Mingoville virtual world, where children can chat with other children from across the globe, this was something that required much planning. The solution we came up with was our Safe English Chat. This system allows the children to communicate, using only pre-approved words. Names aren’t in the database, neither are numbers. Certain combinations of words aren’t shown. If you try to write a word that doesn’t exist in the database, it shows up in red in your text field and won’t be sent. In a single stroke, the amount of inappropriate information being accidentally sent back and forth is eliminated. And if the child isn’t comfortable writing on its own, it can use several pre-defined phrases and sentences. Using the build-in dictionary, the children can pick phrases from ten different categories, like Numbers and letters and Sports and media. This ensures that the language and content discussed in the virtual world is completely safe and without inappropriateness. If a word doesn’t exist in the database, we get a notice. In case it’s a word we’ve overlooked, it gets added to the approved list. This system works and we’ve run Mingoville virtual world for four years where the safety and wellbeing of our young users were in the forefront. We’re still working on Mingoville, improving it and making new features. Our ambition when we started is the same as it is now: Creating a safe game world where children can learn English alone or with others, having fun while they are doing so. If you haven’t already done so, sign up for a free trial on Mingoville.com! Learn why we want to #ChangeBrazil here! The Danish educational company Savivo donates 10,000 free English online education packages to support the #ChangeBrazil movement. Learn why from the CEO & Founder Stephan Stephensen. Like us on Facebook, Twitter and LinkedIn. Learn more about Mingoville with our new fun video! Centenas de jovens encheram as ruas de São Paulo para apoiar o movimento #ChangeBrazil (Muda Brasil). Motivado pelos altos preços do transporte, o protesto abordou temas tais como a corrupção, os altos gastos com a Copa do Mundo e as Olimpíadas e as condições precárias da educação. Stephan Stephensen, CEO e fundador da empresa educacional dinamarquesa Savivo, acredita em educação gratuita e de qualidade para todas as crianças. O conhecimento de Inglês é crucial para permitir que as pessoas vivam suas paixões de acordo com o lema das Olimpíadas de 2016 no Rio, Viva Sua Paixão. É por isso que a Savivo está iniciando uma campanha que oferecerá 10.000 inscrições gratuitas ao curso online de inglês Mingoville. Latina. Em 2009, o Mingoville foi escolhido pelo Presidente e pelo Ministério da Educação do Chile para ajudar a combater o analfabetismo da língua inglesa no Chile. O software tornou-­‐se gratuito para todos no Chile, a fim de promover oportunidades iguais. O programa teve um sucesso imenso e ganhou bastante cobertura da mídia local (CNN Chile, Chanel 13 Chile, El Mercurio, LUN, elvacanudo.cl) garantindo, assim, a atenção do público. Mais de 350.000 chilenos se inscreveram e juntaram-­‐se aos mais de 2 milhões de usuários do Mingoville. “Na Dinamarca, educação gratuita é normalmente tida como certa. Porém, nem todos têm esse privilégio e a filosofia da Savivo é que toda criança devea ter acesso à educação gratuita e de qualidade.” Stephan Stephensen espera que outras empresas participem de sua iniciativa. Ele acredita que quanto mais empresas socialmente mais responsáveis investirem na educação dos jovens, maior serão as chances de fazer a diferença e # #ChangeBrazil. Copenhagen – The Danish educational company Savivo donates 10,000 free English online education packages to support the #ChangeBrazil movement. Share our Facebook Cover and help us spread the news about the initiative! Hundreds young people filled the streets of São Paulo to support the Change Brazil movement. Sparked by high cost of transportation, the protest addressed issues such as corruption, high spending on the World Cup and the Olympics and poor education. Stephan Stephensen, CEO and founder of the Danish educational company Savivo, believes in free and high quality education for all children. Literacy in English is crucial to enable one to live their passions in the spirit of Rio 2016’s Olympics motto Viva Sua Paixão. That is why Savivo is starting a campaign that will offer 10,000 free entries to the online English course Mingoville. Similar campaign has already been successful in other Latin American countries. In 2009, Mingoville was selected by the Chilean President and the Ministry of Education to team up in their fight against English illiteracy in Chile. The software was made free for all in Chile, to promote equal opportunities. The program enjoyed huge success and it had extensive local media coverage (CNN Chile, Chanel 13 Chile, El Mercurio, LUN, elvacanudo.cl) ensuring public awareness. More than 350,000 Chileans signed up and have joined Mingoville’s over 2 million users. “In Denmark, we often take free education for granted. But not all have that privilege, and our philosophy at Savivo is that every child should have access to free and high quality education.” Stephan Stephensen hopes that other companies will join his initiative. He believes that the more socially responsible companies invest in the youth education, the bigger is the chance to make a difference and #Change Brazil. Android users will now have the opportunity to give their children a head start in English using English for kids by Mingoville. It is with great pride that Savivo can present the Android version of the popular Mingoville Preschool. Having worked hard on the app, the game not only boasts the educational and entertaining games from the iOS version, but also several improvements under the hood like an in-app login system and general optimization. In the light of Google’s recent announcement regarding Google Play for Education at their I/O conference, we’re extremely happy with being able to create and distribute educational and fun software on Google Play. We hope that our Mingoville Preschool app will help both parents, teachers and of course children in the first small steps towards mastering the English language. Created to give children a head start, the app serves to build a solid foundation and platform for children to learn English, especially as a Second Language. 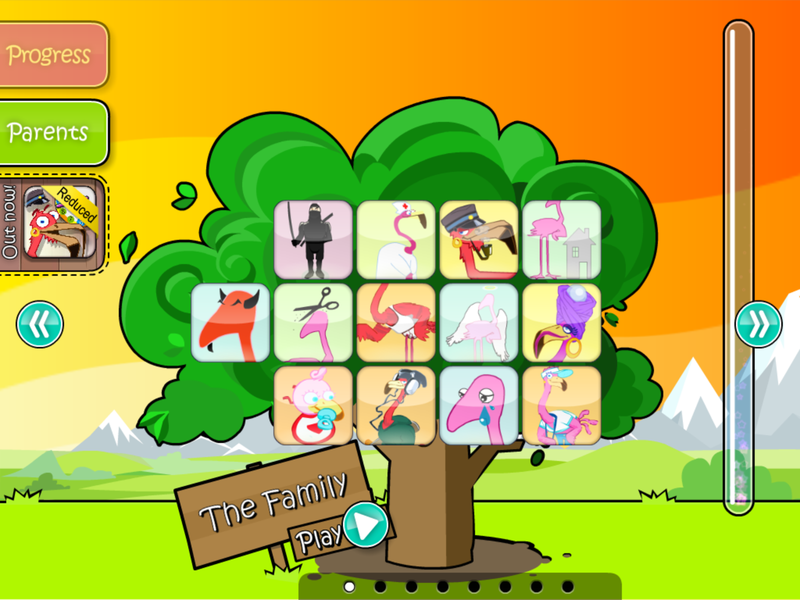 In the app, the children follow the baby flamingo Andrea through seven missions where they begin building up their English vocabulary. Savivo’s philosophy is that children learn best through playing, interacting and repeating. Preschool is designed with this in mind, emphasising educational exercises, positive reinforcement and multisensory game activities. During the game a tree, symbolising the child’s vocabulary, grows as the child completes tasks and enhance its sentence and word recognition skills. In the end, the child will have been exposed to over 500 words and sentences, and completed over 80 interactive games. Utilizing animation and native voice actors, the game strenghtens the child’s pronounciation and listening skills, all the while making the child familiar with the sound of the English language. By using pedagogical methods, friendly voice acting and varied yet familiar tasks, the child wil gain a familiarity with the English language and later in life have an easier time mastering the language. The games in Mingoville Preschool is are created to be easy to understand, have a strong educational element and still entertain the child. The games are quite short, never taxing the patience of the child and each completed exercise awards the child with a sticker to put on the vocabulary tree. One of Preschool’s early games is a simple memory game, where the child has to match the pictures of three animals. The name of the animal is repeated every time a tile is touched, helping the child making the association between the name and the animal. A little later, the child has to do the same memory game, where half the tiles only repeat the name. Here the child has to remember the sound of the animals’ names and match them with the image of the animal. This repeated exposure, combined with a steady stream of encouragement from the characters, ensures that children have an easier time remembering, recognizing and even pronouncing the words. The progressive mission concept creates a meaningful task-oriented game experience for children to retain their focus while learning through play. Over 80 short interactive games spread across 7 missions enabling kids to play at their comfort and not overtaxing their attention span. Positive reinforcement will boost a child’s morale and enjoyment in learning, as Andrea the baby flamingo will constantly encourage and reward the player. Multisensory game activities such as a voice recording game, jigsaw puzzles, listen-and-match the words, spelling bee, memory game, and many more. Numerous improvements, including optimization and an enhanced in-app login system. If you like it, please remember to rate it! At a company making educational games, finding ways to get children to learn more is part of the spirit of our company. And one of our tasks is to find new ways to make children motivated. If a child is very motivated and is having fun, it is more likely that the child learns something. In our English learning game Mingoville English, we had a traditional word seach game. This game is a classic in language education, as it teaches children how to recognize foreign word amidst a grid of random letters, improving their word recognition skills. Our task was to increase the number of words the children recognize, by playing the game. The more time the children spend playing, the more words they are likely to recognize. One incentative is by giving out points. 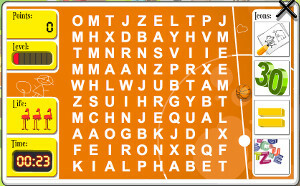 The faster a child manages to find a word, the more points is awarded. Besides giving the child the instant gratification of being awarded by doing well, the points also let the child compete with itself and others. The time limit pressures the child to perform, basically. The child will try to find as many words as possible, before the time finally run out. The time limit also ties in with the next element. For every four words the child finds, the game becomes a little harder. The time the child has available grows shorter. 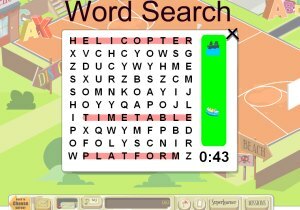 During the first level, the child has 30 seconds per word, but this steadily decreases. In the end, the child only has a few seconds to find each word. In the beginning of each game, the child starts with three lives. Every time the child fails to find a word within the time limit, they lose a life. Once all three lives has been spent, the game is over. The addition of these four elements has transformed the basic word search into a addictive game. Even parents playing the game are having fun, as the level progression, time pressure and constant battle for the high score makes for an enjoyable experience for all ages. It is important to keep in mind that our goal with the game hasn’t changed. To train children in recognizing English words, giving them a better knowledge of the language. Nothing about the learning process has been compromised. However, by gamifying the exercise, we’ve been able to make it more approachable and make children spend up to 300% more time doing the exercise. And by spending more time playing, the child spends more time learning. And that is the whole point of our vision.